In the NICK OF TIME! I bet you thought I forgot about the monthly pinups. No, I didn’t forget about them at all — I was just having a really tough time choosing. In this segment, I pick two well-deserving characters from the science-fiction/fantasy universe. If this is your first time checking out the monthly sci-fi pinups, check out our hot selections for January and February. Until now, we’ve been looking entirely at movie and TV hotties. For this month’s pinups, I wanted a different medium. So I searched through comics, cartoons, and games. Plenty of potentials were available, but the winners were clear. …Cortana from the Halo series! Miss March’s turn-ons are big guns, armor plating, and soldiers who like surfing through space on alien bombs. Her turn-offs include hostile alien species and attempts to wipe out humanity. Sure, she gets a little bossy, but that’s part of her charm. If you plan on spending an evening out with Cortana, you should put your affairs in order and notify your next of kin. And, uh, good luck with that. …Pitfall Harry from Activision’s Pitfall! series! Yes, I had to look up his name in Wikipedia. To be honest, I didn’t even know he had a name. I thought he was simply called “Pitfall Guy”! Mr. March loves gold and silver bars, money bags, diamond rings, and not being run over by gigantic random tree logs that roll out of nowhere and try to flatten him like a noodle. His turn-offs are falling into holes, getting sucked into tar pits, and being eaten by crocodiles. If you plan on spending an evening with Mr. March, be sure to bring a backpack and your Indiana Jones hat. And a huge can of bug spray. How do you feel about this month’s pinups? Do you have suggestions for other pinups? Leave a comment below and let me know! Well done Jen! Not expected at all… and that’s really cool! Thanks John! I was hoping that by making Miss March super hawt, no one would mind if I squeezed in Pitfall Harry, the ultimate adventure man! 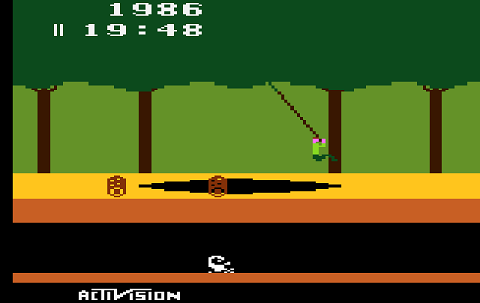 Oh, how I wanted to be Pitfall Harry. And Cortana! (licks fingers, smooths down eyebrows) Nice, uhh, wait, I had something for this. LOL Thanks, Alan! I must admit, Pitfall! was one of my favorite games growing up. I, too, wanted to be Pitfall Harr(iet)!